Are you only using contact form completions and gauging how often the phone rings to determine if your marketing efforts are working? Are you making marketing and advertising budget decisions based only on these two metrics? If so, maybe it’s time that you closed the loop with Call Tracking. You’re missing out on valuable data that can increase your company’s revenues and profitability, while reducing waste. 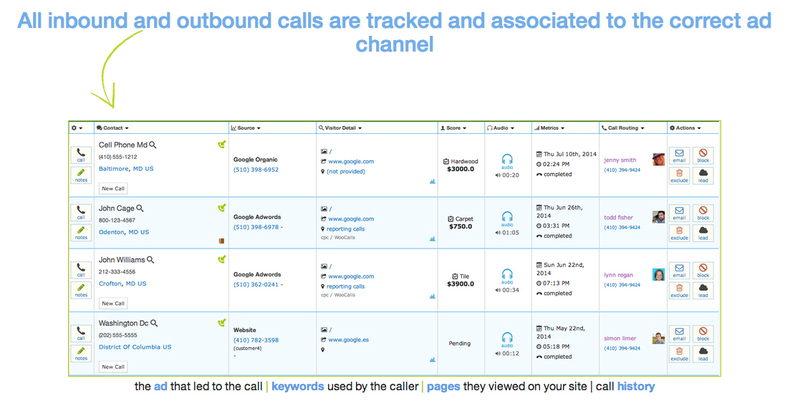 Call tracking enables you to track the details associated with phone calls. This is significant considering phone calls drive 10x more sales than contact forms. If you aren’t tracking your calls, you may be guessing on 90% of prospect inquiries. It’s important for the phone to ring and for potential new customers to fill out contact forms, but at best, you may only have part of the picture and at worst, you may be wasting money by spending it in the wrong areas. It’s not uncommon for advertisers to believe that a certain campaign is a top performer when in fact most of their inquiries come from another digital marketing initiative. In addition, many call tracking software platforms integrate with Google Analytics and with CRM systems such as Salesforce. Imagine being able to track a prospect from initial introduction to your business to close and do so for pennies on the dollar. You can also listen in on calls to evaluate key customer requirements and your inside sales efforts. Customer sales cycles are complex. Potential new customers interact with brands and products online and off. They can come via organic or paid search, social media and email campaigns, etc. by bouncing in and out of landing pages, with phone calls, mobile apps, and any number of other channels. It’s a lot to track and can be difficult to make accurate decisions without complete data. Yet gaining a complete and accurate picture of your marketing attribution (which channels are truly producing qualified leads and conversions) is crucial to getting the biggest return on your marketing dollars. If you’re not using Call Tracking, you may be making less than ideal digital marketing and budgetary decisions. We occasionally find that a campaign is generating an acceptable return on investment, when in fact, additional data could lead to better decision making and increased profitability. Call tracking is a tool that can enable you to make such decisions. For additional information on Call Tracking, please contact us. When you want to know which digital marketing initiatives are working and what isn’t working, as well as what is important, call tracking is a must.